For a company to grow, it needs marketing to be in place and yellow pages does the work for you. Yellow Pages has been a key source of marketing solution provider for businessess and communities to grow. AT&T Interactive and AT&T Advertising has joined and they together formed Yellow Pages in the year 2012. Yellow Pages has over 30 million visitors online every month. If you have feedback for the YP corporate headquarters contact David Krantz iwho s the CEO of Yellow Pages. The best number to reach a live human is 866-329-7118 and the support website is located at mydirectories.yp.com. To order YP.com Directories on CD-ROM call 866-426-8005 or visit www.realpageslive.com. You can also email business development directly at BD@yp.com. Yellow Pages is spread across various locations across the globe making a universal mark in the work that they do. Common problems stem from the retail sector, health verticals, small scale and big scale industry like automative, home improvement information, and restaurants. The company even has a mobile app that make it easy and a very convinient way to find information. I am writing this because I have spoken on the phone to customer service and billing and am getting the cold shoulder and I do not have 2 hours to sit on the phone again, I have a business to run!. I would like the virtual profile taken of my account as it is all wrong and you are billing me $400 for this service, none of the info I gave your guy in June/July is there, no pictures, and the address is wrong, not only that the extra search engines that supposedly opened up..about 8... not 20, all have wrong info on them, the address is wrong. it is very upsetting to me when I have irate customers on the phone because they have been driving around for an hour or more looking for me when they haves planes to catch or their dog is sick in the car or barking incessantly the whole time, ( I own a boarding kennel), I have paid for the regular advertising that I have but the virtual thing is a complete waste of money as far as I am concerned, I am ready to back out of yellow pages altogether, I have never had so many problems. My yellow pages directory was delivered on Nov. 4-5. I live in the Oakridge area of London On. It looks like the lazy person who delivered them walked down the middle of the street and threw them in the general direction of the driveways! Is it too much to expect that they could be delivered to the porch, like any other publication? I take this to be a sign of indifference to the very customers that Verizon wireless is trying to attract with this service. Even the smallest store flyer is delivered to my front door(and even generally placed in the mail box!) Just one more sign that Big Business really doesn't give a damn. My business is listed with YP.com. However, on a Google search, under your YP page, I am still seeing the name linking to an incorrect site - to my competitor. The name must connect only to my website under the telephone number and address that is correct. Please get rid of the incorrect listing on your site, or change it with the correct contact details to my website, or I am prepared to have a lawyer enter a lawsuit for all these years that your site points my business name to the wrong website. I have brought this to your company's attention several times in the past 3 years. What will it take to get this wrongful listing off your page, and off the Google search results? 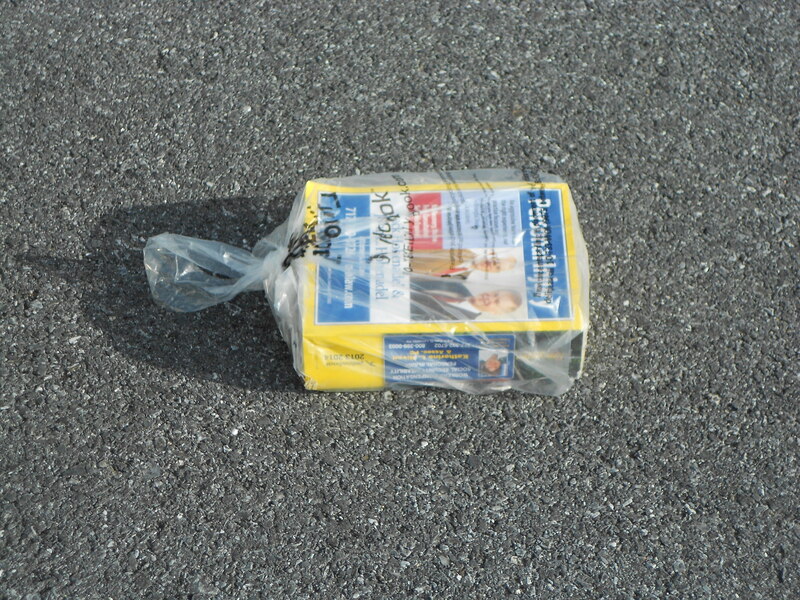 I came home at about 6pm to find the yellow pages ( it looked as though it was thrown ) on the verge open and bent. Near our driveway. Every book in the street was the same. I use to do the delivery of the phone books with the Scouts in Perth and this was not the way we were allowed to deliver them. What would they have looked like if it started to rain. Not very happy with it at all. For Salisbury, NC, Rowan County, there is a listing in the current book for Lillian’s Library under used book, although this business has been closed since at least 2007. I am sure there are other such inaccuracies that noone has bothered to correct. I also note that there is no longer a listing of overseas calling codes. This was in previous directories, but then, I could not even find a number to call for registering a complaint. On calling the number for ordering more YP books (the only means of contact indicated in the book), Iwas given an 800 number that was no longer valid. I suspect that these deficiencies are a symptom of the decline is the use of land-line phones which I sincerely lament. Excuses aside, I believe your business can publish better guides than the one I have received. Please consider my remarks for future publishing. I received a request for a bold listing in the mail for only $15.00 but had to sign the front of the form. I sent in the form with a check for $15.00 and latter they send you a bill for over $300. I then sent them the bill back stating I did not want this service. Sixty days latter they call me threatening to turn my account over to collections for non payment. They expained that I signed the form and on the back of the form in small print is the contact that I aggreed to. This is only a cheap scam to trick people to sign up for expensive servcies without thier knowledge. Never sign a form that states this is not a bill to make corrections or sing up for a bold listing. On the back is the real ccontract. I never knew until now that their are several yellow pages companies and many of them engage in this tricky behaivor. Rule never sing up for anything in the mail and always check the back of anything you sign. I am an owner of a small business that was started in April 2010. We mainly do fax service for customers. As usual, I received one page via fax from yellow pages google advertising on Oct. 25, 2010. The Title was “Yellow Pages – now with free submission to www.google.com”. I did not realize at the beginning that it was a contract, because the terms and conditions stated below the order section at the bottom part of the order form faxed to me were so misleading and unclear. In fact, I did not notice that I would be charged in the amount of $119.00 per month, with two years contract. Upon seeing this, I was terribly shocked and dismayed! My company recently received an invoice from a company called Yellow Pages Advertising Solutions for online advertising. I never ordered or wanted their product/services, have no idea who this company is. I have never had problems with this before, but random bills are not my favorite thing to get in the mail. I wouldn’t even know why I’d eve need to advertise in the yellow pages anyways. I am currently dealing with a company who is trying to help me out with this, but I have already been inconvenienced way too much! Have feedback for Yellow Pages?